Ataulfo Mango- Tropimex mangos are bright orange in color and are the sweetest mango available on the market. The bone or pit of the mango is thin compared to other varieties resulting in more succulent fruit to enjoy. 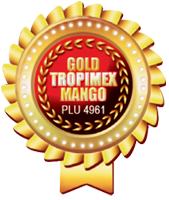 Tropimex does not hot water treat their mango which means the taste and texture of the ripe mango is not compromised. It is offered in a ten pound or thirty pound case. Clemson Spineless Okra - This variety of okra is high quality and is pre-cooled which keeps the freshness intact for a longer period of time. Typically, it is packed in a half bushel case or one pound clamshell. Tai Nung Papaya - This variety of papaya is a sweet, vibrant, salmon-colored fruit with a deep yellow, spotted skin. The papaya is available in a thirty-two pound case. Guava - This bright yellow, golfball-sized fruit is popular for its nutrient dense qualities. It is sold in a twenty pound case, with tray packaging. Avocados- We offer primium hass avocados in 24 lbs case. Tropimex is also proud to offer its own line of asian vegetables which include pea tip, gailan, yu choy, baby bok choy, and shanghai bok choy.